Motos pass us mostly going in the other direction, loaded down with sacks of charcoal, panniers full of plantains, 3 or 4 people with a goat or a handful of chickens held by their yellow legs in between passengers. I am struck by how lush the countryside is, a dark, damp green the color of a heavy banana leaf. Although it is still more or less the rainy season, the thick foliage shows more evidence of it than the thin-threaded rivers cutting between rocky banks. The wider rivers are brown and muddy (the Guayamouc, the Samana), while the thinner ones are turquoise-blue, running shallow over rocky bottoms. In the dark green of the valley between Savanne Longue and Savanne Carrée, I am surprised to see the morning light glancing off the straight trunks of many palm trees, silvering them like a thousand matchsticks stuck in to mark the curves and count the shades of green that blur across the hillsides. Johnston’s musings on the botanical symbolism of a carefully planted regiment of R. regia in 1909 Cuba reflects the neo-imperialist tendencies that drew so many North Americans to the early 20th century Caribbean. Militaristic imagery in the European royalist tradition likewise heralded the birth of the hemisphere’s first Black republic. 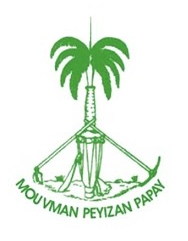 Below is the device that has been on Haiti’s coat of arms since 1807. 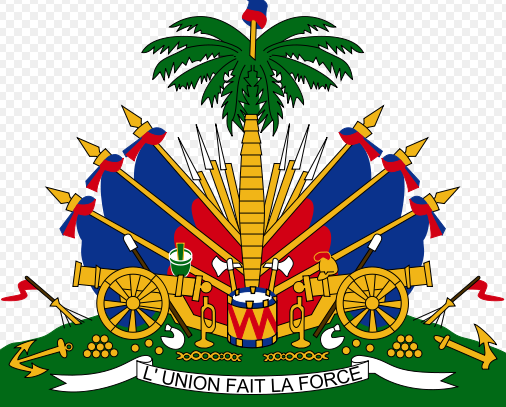 The Haitian flag is one of the oldest in the Americas, its red and blue bars sewn together after General Jean-Jacques Dessalines reputedly ripped the intervening white bar from the French flag at independence. 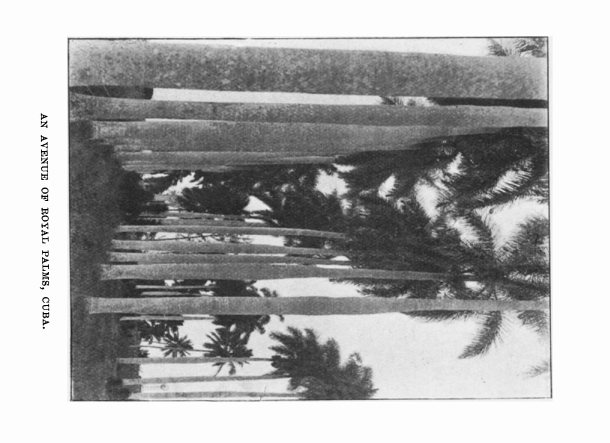 The presence of the Royal palm in this ubiquitous image roots a colonial history in hard-won New World soil. 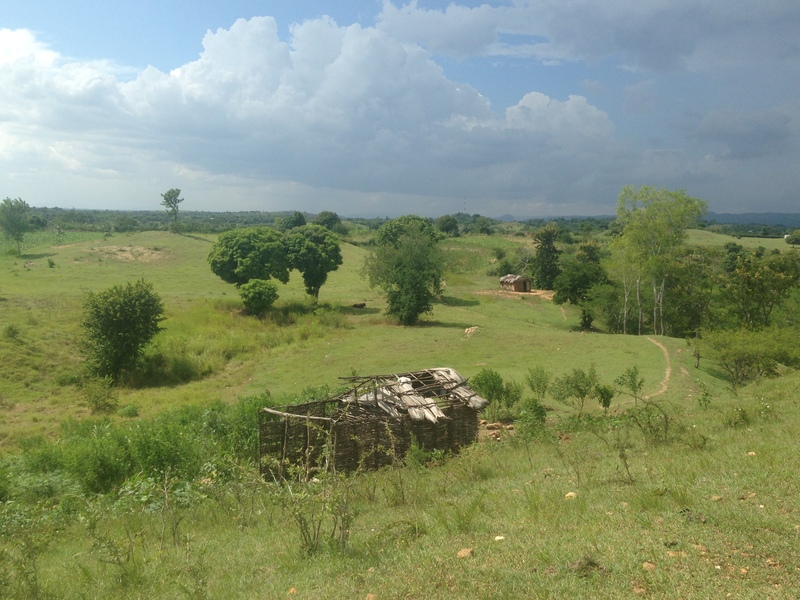 The trunks of R. regia marching across the hills remind me that the ghosts of the Revolution still haunt the countryside, where dictator François Duvalier’s claim “I am the Haitian flag, one and indivisible” was made manifest in the state-led terror of the Tonton Makout. Papa Doc’s security apparatus maintained the dialectical relationship between the violent expropriation of the peasantry and the cohesion of a predatory state – a relation, rooted in the post-independence 19th century, that Michel-Rolph Trouillot brilliantly explores in his foundational work, Haiti: State Against Nation (1990). Yet the palm trunks that shine silver across the Central Plateau also remind me of the unruly peasantry, born in Revolution, that has persisted and resisted despite 200 years of military coups, imperialist occupation, and state violence. This is MPP’s device, depicting a palm surrounded by a set of cultivator’s tools that has changed little since the 18th century. This image urges me to rethink resilience, again, this time as a material practice that hints at another world inside, beside the globe remade by imperialist state violence. 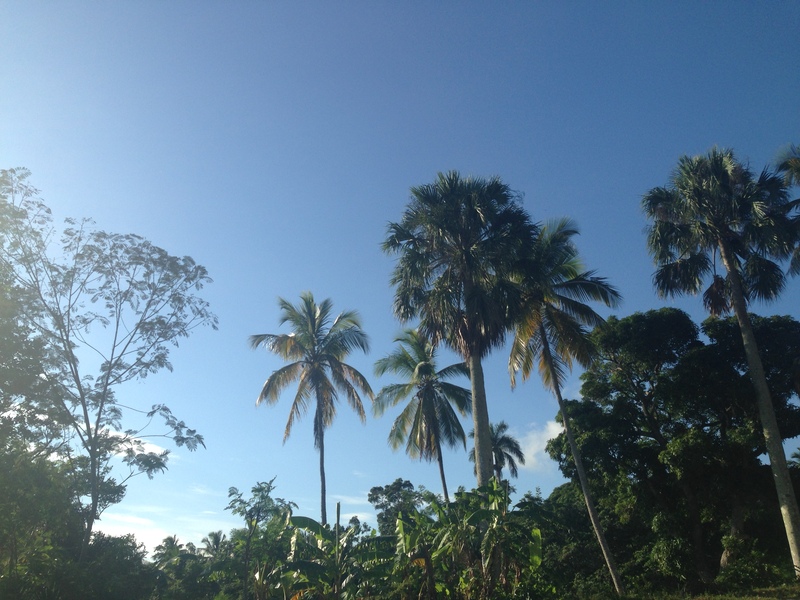 II remember how the morning sun shone off those palm trunks, deep in hills whose green is crossed by no roads but for hundreds of footpaths that once threaded through thick forest, when Haiti still had forest. In Savanne Carrée, as I swoop by on the back of a cheap Japanese motorcycle, peasants lead donkeys along the side of the smooth asphalt road, with golden green cylinders of woven palm leaves strapped to their rope saddles, sharp frond ends waving gently. Everything that is not made of “Miami rice” sacks seems to be made of woven palm: flat wide baskets and straw hats, the golden strips woven into a stiff, strong material. I also notice the region’s typical twig and mud houses, with brown, curled palm leaves as a roof, and more discarded fronds neatly gathered into piles at the side of the road. Only the motorcycle, the smooth asphalt road (funded by the European Union), and the cell phones I know are in every pocket tell me that we are not in the 19th century – there are ghosts in the land. Johnston, H. (1909). The Scenery of Cuba, Hispaniola (Haiti), and Jamaica.The Geographical Journal, 33(6), 629–666. Trouillot, M.-R. (1990). Haiti, state against nation: The origins and legacy of Duvalierism. New York: Monthly Review Press. Weaver, P. (1979). Agri-silviculture in tropical America. Unasylva, 31(126), 2–12.